The VF-1 was created between 1980, and 1982 by Japanese mecha designer Shoji Kawamori with contributions by his Studio Nue partner Kazutaka Miyatake. 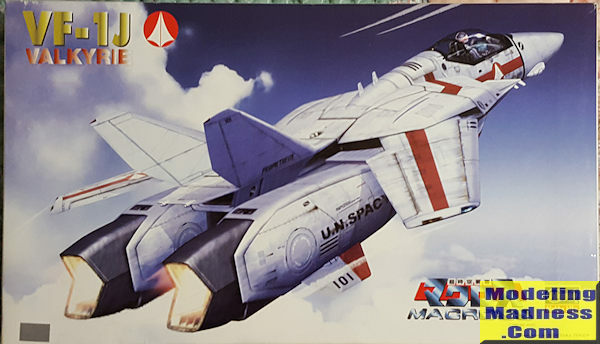 The VF-1 Valkyrie was to be the centerpiece mecha design for the anime series The Super Dimension Fortress Macross which aired between 1982, and 1983. The McDonnell Douglas F-15 Eagle and Grumman F-14 Tomcat with its variable-sweep wing design, served as the main design inspiration of the VF-1. When it came to naming "Valkyrie" was used as a tribute to the real world XB-70 Valkyrie, which was an experimental supersonic strategic bomber developed in the United States in the 1960s.Contrary to popular belief, the VF-1 was created entirely by Kawamori and Studio Nue, without any involvement from Harmony Gold USA or Carl Macek. I'll leave it to you to google Macross to learn more about the series. This particular kit is the VF-1J, a model used by team or squadron leaders. License-produced by Shinnakasu Heavy Industries. First model capable of using the GBP-1S Armored unit. Fitted with twin anti-aircraft laser cannons. For those of you who read the build article of the previous VF-1A, this one is similar in its overall look, but carries twin cannon on the forward underside fuselage. 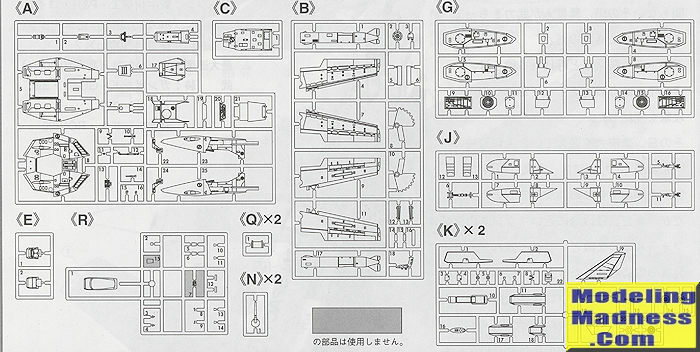 Since this is a Hasegawa kit, we have a certain level of expectation regarding the quality of what is provided. We get it. 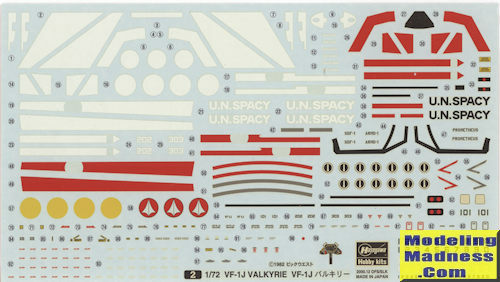 This one is molded in white plastic with the usual mass of sprues as they do several other variants of the VF-1. This one does not transform and needs to be built as the standard 'aircraft'. I put that in parenthesis as the VF-1 is capable of operating in space as well as air. Cockpit is pretty basic and includes a four piece seat, a tub, rear section and instrument panel that takes a decal. This fits into a separate nose section with a closed canopy. The small central body section has an air brake that can be modeled open. Again there are inserts and one also builds up the gearing assembly for the swing wings. These wings are in upper and lower sections and simply glue onto stubs. Most of us will install these at the end to make painting them easier. Even the wings have little clear inserts in the leading edges. The main weapon is a larger central cannon that can be extended for use as a rifle when the aircraft is in full walking robot mode. The lower smaller dual cannon pod is the other aircraft weapon. There is a rear fuselage section that includes some of the jets along with the upper fins. Lower ones are eventually attached to the main engine pods, which are the legs for the robot. The exhaust petals are adjustable. These pods also contain the main landing gear assembly while the nose section has the multi-part nose gear. The kit does not appear to be able to be built gear up, though I'm sure it wouldn't be too difficult. Finding a place for the display stand would be and none is included. Also not included are any underwi ng stores. I have been told that Hasegawa offers a weapons set just for the VF-1. Instructions provide the usual well drawn construction steps (16) and Gunze paint references. There are two different color schemes. One is the box art plane and the other is one is either mostly red or mostly bright blue. All the various stripes on the wing and fuselage are provided, but on the red or blue one, you'll need to do some painting of things like the radome, and the large white areas on the main engine pods. The large decal sheet is quite nicely done and should work just fine. A simple build this will not be. There are a lot of small pieces, but the end result will be a very nice model to add to your shelves. Those who are fans of the Macross or Robotech series will want to give this one a go. It isn't a new kit, but a quick google showed that both this and the 1/48 version are pretty easy to find. I'd recommend it for those wanting something different. I think you'll like it. Thanks to Bill for this nice kit.